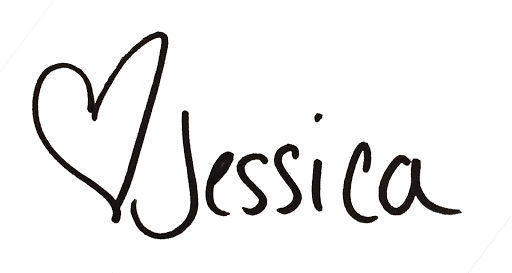 It has been quite some time since I wrote last! End of school + start of summer holidays left me searching for a new routine and I have finally found it! Our days are now full of random play, various activities and outdoor wandering when it isn’t suffocatingly hot out. I know – super weird for someone who loves the outdoors and growing things to despise the heat but I do. I really dislike it. Our yard seems to be home for quite the collection of creatures this summer! 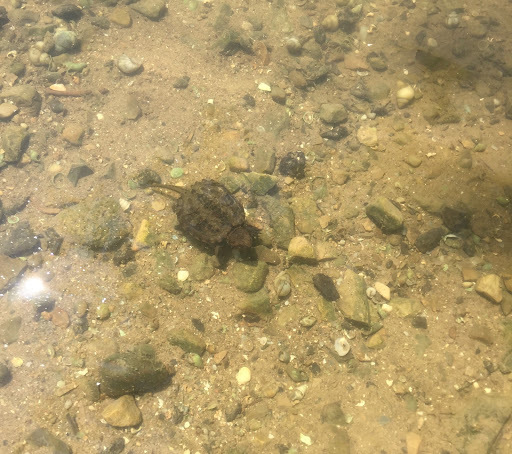 If you follow along on Instagram you have already seen the adorable baby snapping turtle Wally found. The kids really enjoyed caring for the wee one until we were able to release him on the river bank. It was a great learning opportunity for us all! Did you know it takes them 17-20yrs to mature? Although they live to be 100+ years the population is declining greatly as majority are killed on the road or at the hands of humans long before they have even laid their first eggs. There is a little garter snake living under our porch though I am the only one to see it thus far. Garter snakes are awesome for pest control. Country living means mice are abundant so we appreciate their help keeping mice out of the house! Toads galore can be found in and around the gardens. There is a really large one that lives near our back steps that the kids always look for it when they head out back. 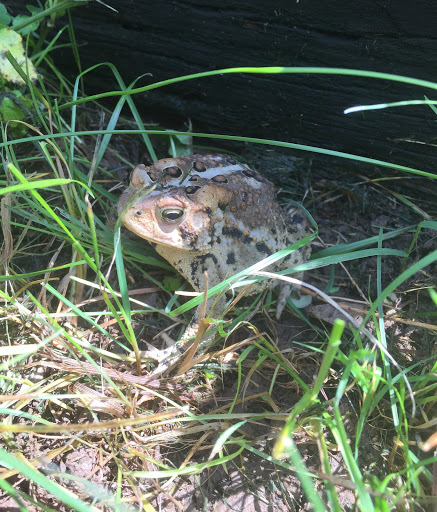 Toads are great at helping keep unwanted insects away – like mosquitoes. No one needs those around! And we can’t forget the furry creatures! There are chipmunks are everywhere! These adorable little critters are found playing games with each other all around our property. Rabbits are always plentiful and we have seen some deer as well. Though we aren’t really THAT removed from the city, it sure feels as though we are in our own little world as we watch all the little things happening around us. 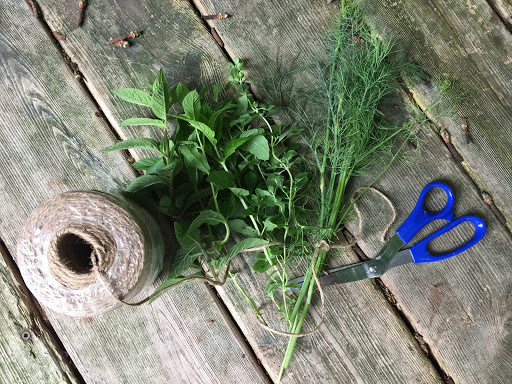 Though my gardens are nothing special this year I do have quite the herb collection. Basil, peppermint (so much peppermint! ), spearmint, chocolate mint, parsley, cilantro, sage, rosemary and dill are all favourites in the garden. I recently planted a couple lavender plants for both it’s beauty and scent! All the herbs are fantastic fresh. Sliced tomato – I can’t wait for fresh off the vine tomatoes! – cheese and genovese basil drizzled with olive oil and balsamic vinaigrette is an easy dinner addition I love. I’m also a hug fan of mint and honey added to mixed berries as dessert! I like to dry herbs as well for seasoning sauces and other delicious things all winter long. Thyme, oregano and dill are my favourites to hang in the kitchen to dry. Basil, sage, mints and rosemary I find dry much better in the small dehydrator I have. 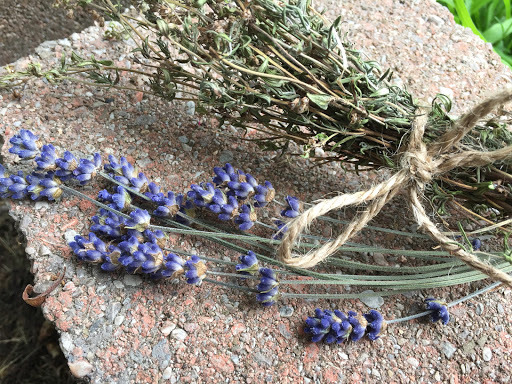 This year is the first I have dried lavender and it seems to be doing well just hanging off the cupboard doors! I plan to use it in teacher gifts for Christmas with my daughters help. Our summer vacation has started out well, I look forward to mini day trips exploring new places and visiting favourites with my little humans and Wally in tow!